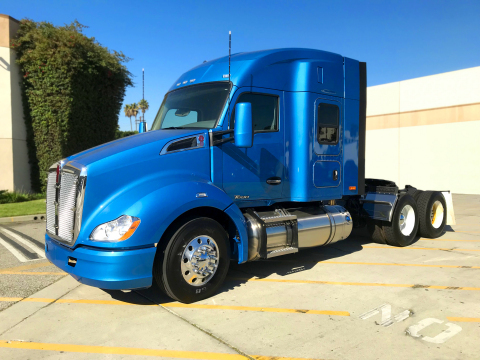 Clean Energy Fuels Corp. (Nasdaq: CLNE) announced it will supply Redeem™ renewable natural gas (RNG) to intermodal trucking company Overseas Freight as part of an emissions reduction initiative in the Ports of Long Beach and Los Angeles. In preparation for upcoming regulations outlined in the San Pedro Bay Ports Clean Air Action Plan (CAAP), Overseas Freight obtained Prop 1B funding for five Kenworth T-680 trucks outfitted with the new Cummins-Westport (CWI) near-zero ISX12N natural gas engine, which achieves the lowest emission levels in North America while delivering diesel caliber performance with reliability and durability. The ISX12N is certified by California Air Resources Board (CARB) to reduce smog-forming NOx emissions by 90 percent compared to the current engine standard. Overseas Freight has contracted for RNG fuel through the Clean Energy Redeem $1 Deal, which guarantees a fixed fuel price of one dollar per gallon for a year. Redeem allows customers to achieve a reduction in greenhouse gas (GHG) emissions by at least 70 percent versus diesel. Organically sourced from dairy and landfill waste, Redeem is the cleanest commercially available fuel for trucking, with some RNG sources even reducing GHG emissions by over 100 percent. Clean Energy Fuels Corp. is the leading provider of natural gas fuel and renewable natural gas (RNG) fuel for transportation in the United States and Canada, with a network of approximately 530 stations across North America that we own or operate. We build and operate compressed natural gas (CNG) and liquefied natural gas stations (LNG) stations and deliver more CNG, LNG and RNG vehicle fuel than any other company in the United States. Clean Energy sells Redeem™ RNG fuel and believes it is the cleanest transportation fuel commercially available, reducing greenhouse gas emissions by up to 70%. Clean Energy owns natural gas liquification facilities in California and Texas which produces LNG for the transportation and other markets. For more information, visit www.CleanEnergyFuels.com.